Camera app now has a distinctive black interface that appears intended to frame your shots with a neutral border, even if you have a dazzling white iPhone 5 (above). 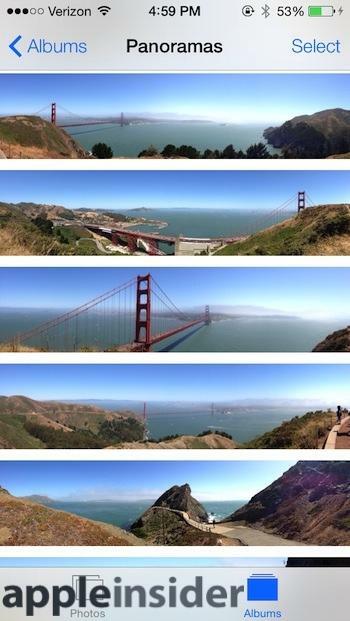 There are now three capture modes for still photos: the standard Photo, a new Square frame (shown together, below), and Pano for capturing the horizontal or vertical panoramas introduced last year in iOS 6. Switching between modes is now a simply a Coverflow-like flick control of the various modes, positioned above the capture button. 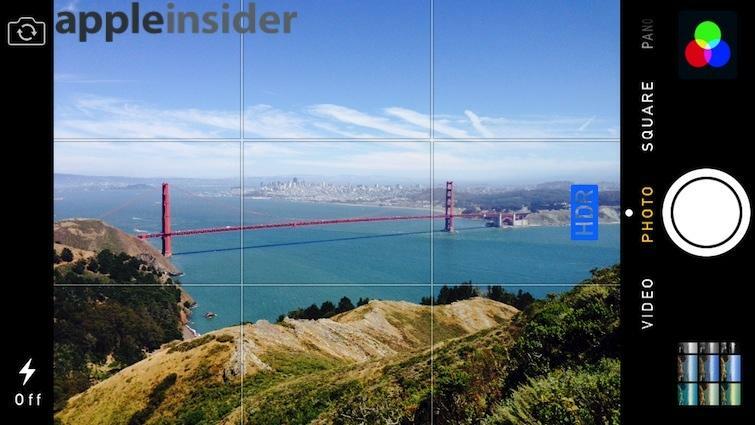 Square capture simply frames the shot. 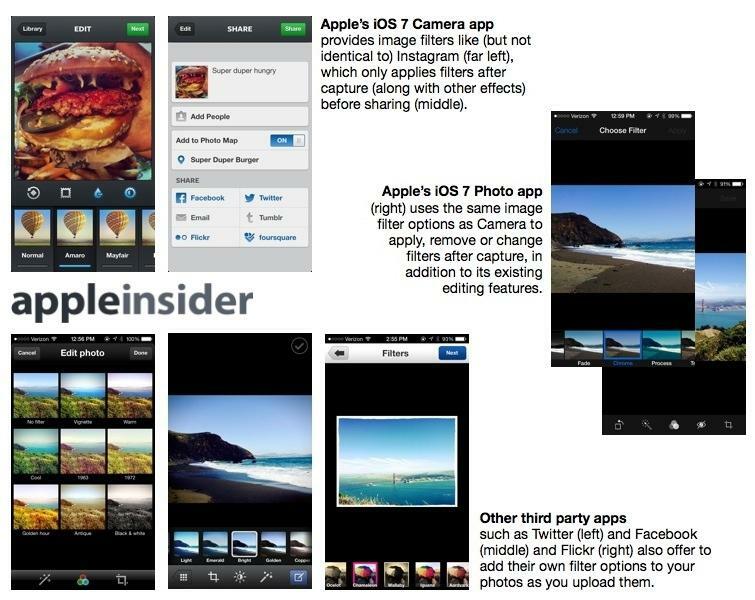 The primary purpose of this mode appears to be composing shots for sharing via Instagram. The benefit to shooting with Apple's Camera app rather than within Instagram itself is that Apple provides High Dynamic Range capture, first introduced in iOS 4.1 in late 2010. HDR capture is now activated or disabled by tapping on the blue onscreen HDR indicator, rather than being hidden in a menu (along with Panorama capture) as was previously the case. When off, the HDR indicator goes grey. Apple's new Camera app photo filters, accessed by tapping on the grey overlapping circles, will likely remind users of Instagram, which popularized the idea of applying effects to photos to enhance them before posting to its social network of image feeds. However, Apple's new filters actually work more like those in Photo Booth, which dates back to OS X Tiger from 2005. Clicking on the filters icon gives you a live preview of the eight included effects and with no filter (as shown below). After you select one, the filters icon changes to red, green and blue colors (below) to indicate it is being applied as a live effect as you compose your shot (similar to Photo Booth). Apart from live previews of the filter effect, another significant difference with Apple's filters compared to Instagram's (and similar photo filters now offered by other social photo sharing services including Facebook, Twitter and Flickr, below) is that after applying a filter at capture (or adding a filter to a saved photo from within Photos), you can remove the effect or change to a different filter. This sort of non-destructive editing appears to be facilitated by Apple's work in Core Image processing and Quartz Composer style image processing filters, also used in other Apple apps such as iPhoto and Aperture. Once you capture shots and optionally apply a desired filter, you can edit the photo within Camera app's Camera Roll. To share them, or to browse your Albums or the new Moments, Collections and Years groupings, you have to (as with previous iOS releases) exit Camera and enter the separate Photos app. Apple presents its own "Shared Streams" feature of iCloud's Photo Stream (depicted below) as a menu within Photos for sharing photos in a feed your friends can gain access to add their own shots to an online album. 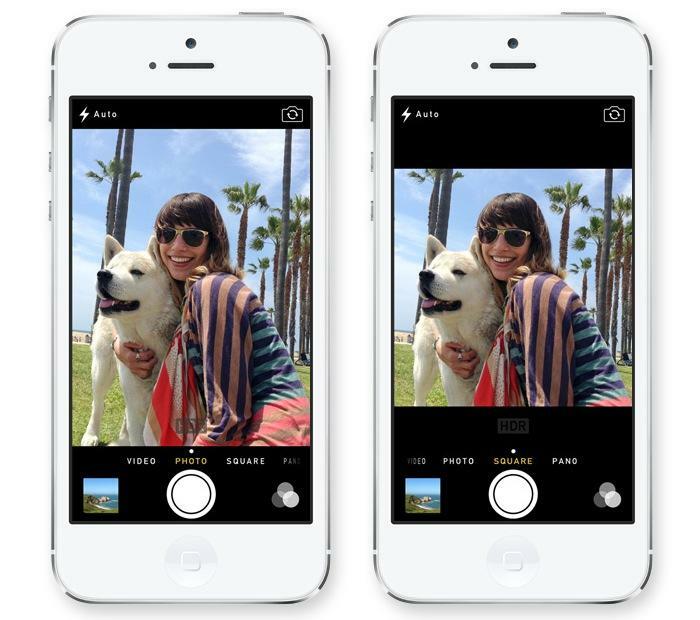 You can also quickly share photos via iOS 7's enhanced Share Sheet. 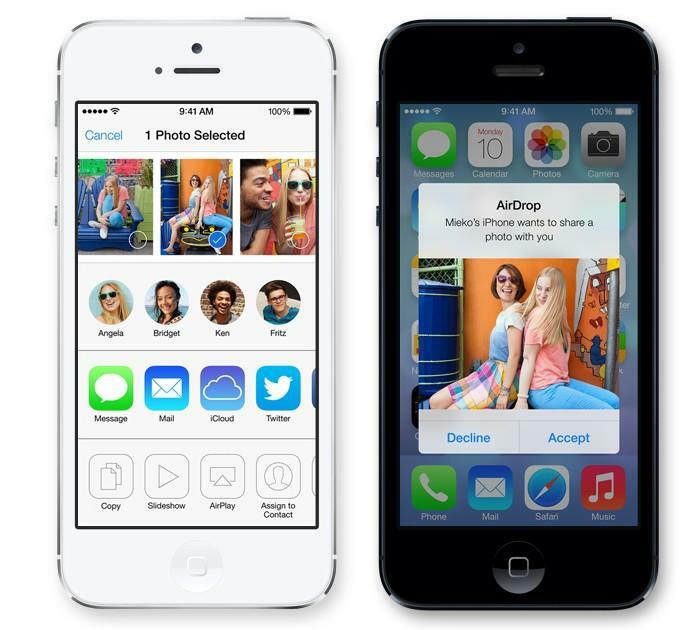 This includes the ability to AirDrop photos directly to other nearby users (below); use Messages or Mail to send photos directly to a list of users; or upload photos to an iCloud stream or to your configured Twitter, Facebook or Flickr account. There's also a menu of options that lets you Copy your selected images to the clipboard; present a series of images as a Slideshow, wirelessly project your images on a TV via AirPlay; Assign an image to a contact, Use it as a wallpaper, or Print it via AirPrint. If you want to share to a different service (such as Instagram), you have to open that app. While Instagram only offers static filters you apply after capture, it provides a broader selection of them, along with some creative blurring effects and frame styles. 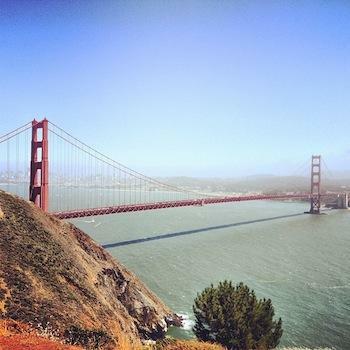 Instagram can take an iOS 7 photo, composed as a square using HDR capture, and add its own filter on top. It also includes options to tag the location via Foursquare, something that can additionally check you into that social network's locations. At the same time, you can also send your capture to not just Instagram, but also Facebook, Twitter, Tumblr and Flickr, or manually email the photo. To similarly share a photo across a range of services, Apple's iOS 7 Share Sheet involves more steps for composing comments, setting location and tagging people in the photo per service, but also offers some service-specific features Instagram doesn't (such as tagging Facebook friends, a curious omission for Instagram given that Facebook owns it). Just like Instagra's app, Twitter, Facebook, Tumblr, Flickr, Picassa and other sharing apps also offer their own service specific features within their standalone apps, allowing users to decide which tools they like best. 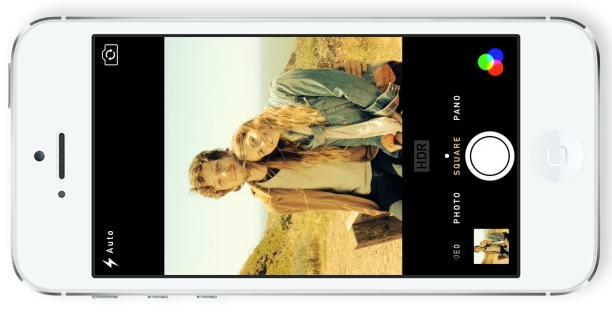 Video capture is also enhanced in iOS 7, although there isn't (yet) support for adding live filters to your videos. After capture you can use Apple's separate iMovie app (or a variety of third party options) to add video effects. The new Camera app now supports both still photo captures while recording and pinch activated digital zoom. You can capture photos while zoomed in, but the image quality will deteriorate because digital zoom (rather than optical zoom) simply uses less of the available image sensor and blows up the result. There are also external lens kits you can add to your iOS device to capture wide angle, fisheye and closeup photos and videos, for effects you can combine with the new digital zoom in creative ways. 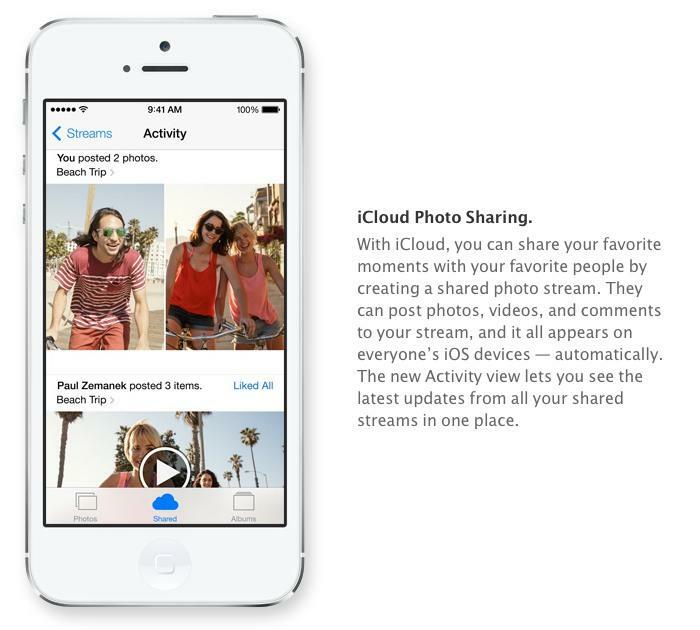 Once captured, you can share videos via Apple's iCloud in a Photo Stream, or via Facebook or Vimeo. The current build also presents YouTube as a sharing option (although it currently doesn't work). Google's video service also still doesn't appear in iOS 7's internet account sharing settings. Two other popular video sharing services, Snapchat and Twitter's Vine, don't yet allow you to either upload or work with previously captured videos. 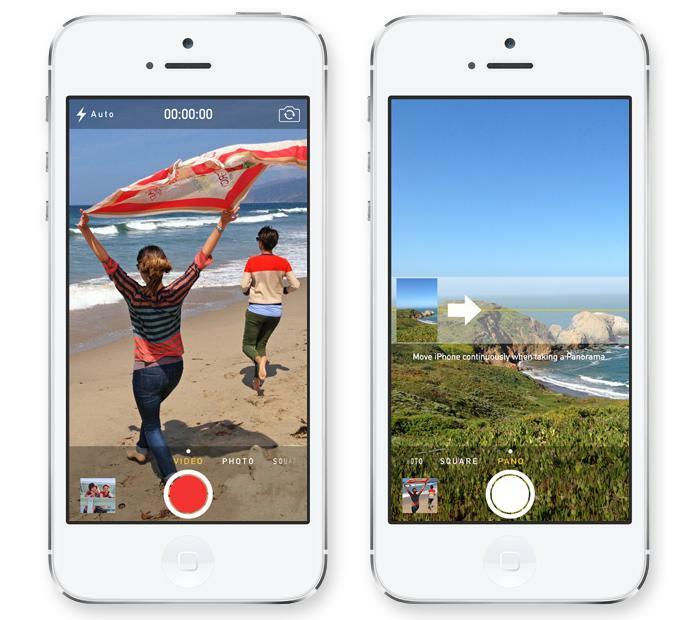 The iOS 7 Share Sheet for videos also includes support for Slideshow or AirPlay presentation. 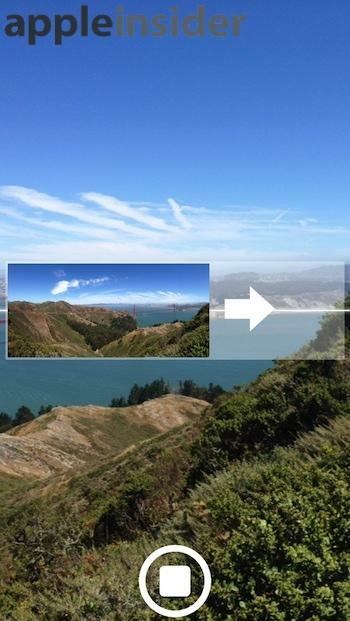 As with videos, you can't currently apply filters to Panoramas at capture. However, you can now apply the same non-destructive filters after the fact from the Photos app, which also now handily adds all your panos in a separate folder, just as with videos. Photos also lets you auto-enhance, rotate, correct redeye or crop a captured pano, or share them just like any other captured photo or square. 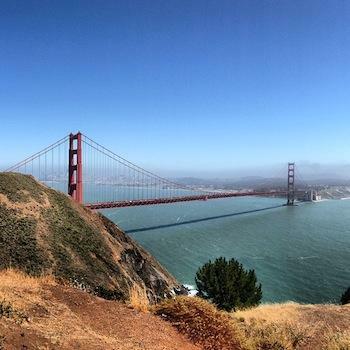 If you share photos with a service like Instagram, you may find that the optical distortion in panos (not new in iOS 7) offers a way to crop down to a creative, high quality image of a portion of your pano in a way that mimics a wide angle lens. Compare the "digital wide angle" shot captured with iOS 6's Panorama feature and shared on Instagram (below top) with the shot captured normally within Instagram (below bottom). iOS 7's new filters and sharing options are a welcome addition, and can be of use even to users who prefer the sharing options built into a separate service like Instagram. 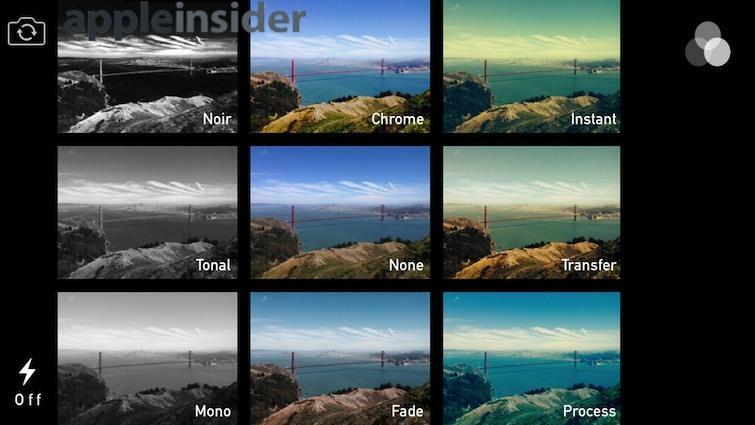 In the future, it'd be great to see Apple add more filter options and potentially support third party filters, although this added complexity might make more sense in a separate app such as iPhoto, which presents much more fine grained control over video correction, image processing and color controls.